Ruby's Diner Celebrates 36 Years! 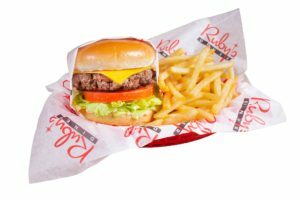 Ruby’s Diner Celebrates 36 Years! Celebrating 36 Years of Burgers, Fries and Shakes! On December 7th, 1982 our founder and CEO, Doug Cavanaugh, opened the doors to the very first Ruby’s Diner. Located at the end of the Balboa Pier, what once was an old bait shop had been transformed into a sparkling diner with authentic antique décor, jiving tunes, and friendly service. Ruby’s Diner was seemingly straight from the 1940’s. The tiny 45-seat restaurant, which was named after Cavanaugh’s mother, Ruby, opened with just three employees and a simple menu of hamburgers, hot dogs, and malts. In its first day, it brought in a whopping $63, but most importantly, smiling guests looking to remember a simpler, happier time. 36 years later Ruby’s Diner restaurants can be found from California to New Jersey, including malls, casinos and airports! We are proud to continue the legacy of providing guests with quality service and delicious diner cuisine. Here’s to many more years of Shooby Doobying down to Ruby’s! To celebrate we are inviting you to join us on December 5th 2018, from 11:30 AM to Close, for a $2.99 Burger and Fries special! Participating Ruby’s Diner locations will offer this celebratory deal only while supplies last. To make the deal even sweeter, $1 from every $2.99 burger purchased will be donated to the Ruby Dooby Foundation. The Ruby Dooby Foundation carries on the legacy of giving and compassion embodied by Ruby Cavanaugh, who adored children. The proceeds from the 36th anniversary celebration will directly benefit the Ruby Dooby Foundation. In the past year, $20,000 has been donated to various children’s charities including Miracle Babies, CCHS, Orange County School of the Arts, and CHOC. Which Ruby’s Diner Locations are Participating in our Anniversary Special? Ruby’s Diner locations participating in our $2.99 special on December 5th may vary. Please feel free to call your local Ruby’s Diner to see if it will be joining the celebration! This offer excludes casinos, airports, sporting venues and food court locations as well at Ruby’s Shake Shop in NOHO. Offer valid one day only 12/5/18 11:30 AM – Close. Additional charges apply to additions or substitutions. All other burgers and menu items are full price. One Anniversary burger and fries per guest. Offer stands while supplies last. For full list of participating locations click here. VALID FOR DINE IN ONLY AT PARTICIPATING LOCATIONS.